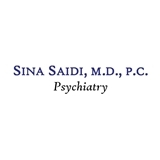 Sina Saidi, M.D., P.C. (New York) - Book Appointment Online! The aim of my practice is to provide the expert psychiatric care that will allow you to perform at your personal and professional best. This is done by: - Creating an empathic and trusting environment for our work together. - Uncovering and addressing all the factors in your life that may affect your present condition. - Practicing evidence-based psychiatry and remaining well-informed about the latest scientific and clinical knowledge in my specialty. - Optimizing your overall health through collaboration with your other healthcare providers as needed. - Protecting your health and welfare by strict adherence to professional codes of ethics and conduct, and by steadfastly guarding your privacy. Dr.Saidi is a rare gem among colorless stones that make up this profession. I had my first visit with him today and knew within minutes he was the real deal. This is a man whose qualifications alone were enough to get me on the LIRR for an hour to meet him. He didn't disappoint. For the first time in years I feel confident I can beat my anxiety and ADD and confident in the doctor who will help me do it. Those writing negative reviews need to realize this is a Harvard grad and the real deal. If you're looking for honest help, this is the guy you want. But if you're looking for someone who will "take your order", I suggest you try McDonalds. You won't find that here.